A major producer of natural gas, oil, and agricultural products, Oklahoma relies on an economic base of aviation, energy, telecommunications, and biotechnology. Both Oklahoma City and Tulsa serve as Oklahoma’s primary economic anchors, with nearly two-thirds of Oklahomans living within their metropolitan statistical areas. The Cherokee are a people from North America, who at the time of European contact in the 1600s, inhabited what is now the Eastern and Southeastern United States. Most were forcibly moved westward to the Ozark Plateau. They were one of the tribes referred to as the Five Civilized Tribes. According to the 2000 U.S. Census, they are the most numerous of the 563 federally recognized Native American tribes in the United States. Of the southeastern Indian confederacies of the late 1600s and early 1700s (Creek, Chickasaw, Choctaw, etc), the Cherokee were one of the most populous and powerful, and were relatively isolated due to their hilly and mountainous homeland. Beginning at about the time of the American Revolutionary War in the late 18th century, divisions over continued accommodation of encroachments by white settlers, despite repeated violations of previous treaties, caused some Cherokee to begin to leave the Cherokee Nation. Many of these dissidents became known as the Chickamauga. Led by Chief Dragging Canoe, the Chickamauga made alliances with the Shawnee and engaged in raids against colonial settlements (see Cherokee–American wars). Some of these early dissidents eventually moved across the Mississippi River to areas that would later become the states of Arkansas and Missouri. Their settlements were established on the St. Francis and the White Rivers by 1800. Broken Arrow is a city located in the northeastern part of the U.S. state of Oklahoma, primarily in Tulsa County with an extension into western Wagoner County. 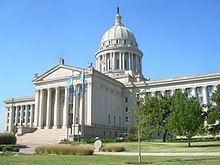 It is the largest suburb of Tulsa and the 4th largest city in the state. As of the 2006 census estimates, the city had a total population of 88,314 while the city’s current estimate puts the population at just over 97,000. It is estimated that at the 2010 census, the population will well exceed 100,000. Automobile Alley Historic District, an upscale urban neighborhood in Oklahoma City. …that Tulsa is often considered the birthplace of U.S. Route 66? …that Oklahoma has the longest drivable stretch of Route 66 in the nation? …that in 1927, Oklahoma businessman Cyrus Avery, known the “Father of Route 66,” proposed using an existing stretch of highway from Amarillo, Texas to Tulsa for the original portion of Highway 66? …that Oklahoman Cyrus Avery spearheaded the creation of the U.S. Highway 66 Association, the organization that oversaw the planning and creation of Route 66, and he placed the organization’s headquarters in Tulsa? Jacobus “Jim” Thorpe born May 28, 1887 in Prague, Oklahoma, is considered one of the most versatile athletes in modern sports. He won Olympic gold medals in the pentathlon and decathlon, starred in college and professional football, played Major League Baseball and also had a career in basketball. He subsequently lost his Olympic titles when it was found he had played two seasons of minor league baseball prior to competing in the games (thus violating the amateur status rules). In 1978, Thorpe was given his own national holiday, which is still celebrated on May 28.